SEATTLE--(BUSINESS WIRE)--Jun. 19, 2018-- (NASDAQ:AMZN)—Amazon today announced Alexa for Hospitality, a new experience offered by invitation to hoteliers that brings the simplicity and convenience of Alexa to hotels, vacation rentals, and other hospitality locations. Using the Amazon Echo in their room, guests can now ask Alexa for hotel information, contact the hotel to request guest services, play music in their room and more. For hotels, Alexa for Hospitality helps deepen guest engagement through seamless voice-first experiences that offer new ways for guests to access services and amenities during their stay. Alexa for Hospitality is available to hospitality providers by invitation starting today, with Marriott International introducing the new Alexa experience at select properties in Marriott Hotels, Westin Hotels & Resorts, St. Regis Hotels & Resorts, Aloft Hotels, and Autograph Collection Hotels starting this summer. With Alexa for Hospitality, hospitality providers can enable and customize a range of voice-first features based on their guests’ needs. Using an Amazon Echo in their room, guests can ask Alexa for information like pool hours or fitness center location, request hotel services like room service or housekeeping, call the concierge, and more. Alexa can also be configured by hospitality providers to allow guests to control and adjust in-room devices like lights, thermostats, blinds, and TVs to their individual preferences or ask Alexa to play music from popular services including iHeartRadio and TuneIn. Guests can also be given access to thousands of Alexa skills to check airport wait times, play games, get in a quick guided workout, play white noise to help them fall asleep, and more. Hospitality providers will also have the option to allow their guests to personalize their Alexa in-room experience. 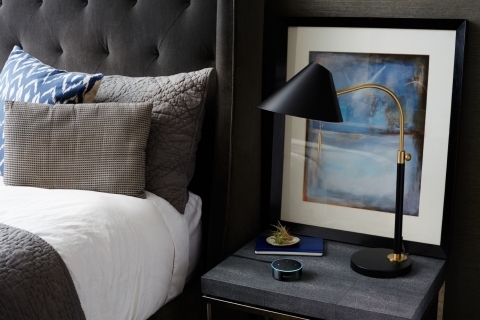 Soon, Alexa for Hospitality will support the ability for Amazon customers to temporarily connect their Amazon account to the Alexa-enabled device in their room. Once connected, guests will be able to play their personal music from services including Amazon Music, Spotify, and Pandora; and listen to audiobooks with Audible. When a guest checks out, Alexa for Hospitality automatically disconnects their Amazon account from the in-room device. Alexa for Hospitality makes it easy for vacation rental companies like RedAwning and boutique lifestyle properties within the Two Roads Hospitality portfolio including Thompson Hotels, Joie de Vivre, Destination Hotels and Alila to manage their property experiences and engage with guests. Hospitality providers can provision Echo devices in just minutes to get up and running quickly. Alexa for Hospitality also supports hardware settings like limiting volume level and administrator notifications if a device goes offline. Hoteliers can also use Alexa for Hospitality to measure engagement through analytics and adapt services based on guest feedback. Hotels can also customize the deployment by selecting default music stations from iHeartRadio stations that match their brand, adding property contacts to order room service or booking a spa treatment, and connecting to custom skills that only their guests can access. For example, Marriott Hotels guests, at properties where Alexa for Hospitality is deployed, can take advantage of the brand’s partnership with TED by requesting Alexa play a TED Talk on mindfulness, creativity or leadership. Alexa for Hospitality is built to work with existing hotel technologies, reducing or eliminating the need to retrofit or upgrade existing investments, and works with a range of trusted hospitality solution providers. Features developed by DigiValet, Intelity, Nuvola, and Volara allow guests to make requests like “Alexa, order wine,” or “Alexa, book a spa appointment,” with requests routed to hotel property management systems. Alexa for Hospitality also works with popular guest room entertainment providers including World Cinema and GuestTek for voice control of TV experiences, and in-room control of connected devices using Crestron and Inncom by Honeywell. For more information visit www.amazon.com/alexaforhospitality.